with closing date of submission of Online Applic ation being 23:59 Hrs. 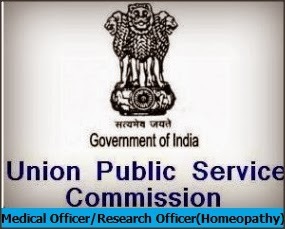 on 27.02.2014 for Recruitment to 27 posts of Medical Officers/Research Officers (Homoeopathy) in Department of Ayush, Ministry of Health and Family Welfare. (d) There will be penalty for wrong answer. Every wrong answer will carry a deduction of one-third of the marks assigned to that question. If no answer is mark ed for a question, there will be no penalty for that question. NOTE-I: INTIMATION ABOUT VENUE OF THE RECRUITMENT TEST WILL BE COMMUNICATED TO THE CANDIDATES IN DUE COURSE. NOTE-II: RESPECTIVE WEIGHTAGE OF THE RECRUITMENT TEST AND INTERVIEWS SHALL BE AS DECIDED BY THE COMMISSION. NOTE-III : NO REQUEST FOR CHANGE OF CENTRE WILL BE ENTERTAINED.